on vol. 6. Assane we know, is Yamar his brother, or maybe himself ? surprising routes. Vols 6, 7 and 10 are particularly strong. works best as one extraordinary stream of consciousness. Well, didn’t know I was that lucky, but now you are too. while the tape inlay says 6’39, a minor incident. Thank you very much for sharing these rarities. What a shoot of great post. Many Thanks. I believe, that Yamar Thiam is Assane uncle (by his mother). 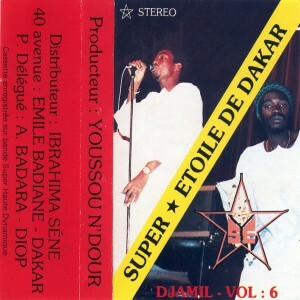 He was played with Canari de Kaolack (we can listen the singer singing his name in their Sutukun version). And after he was part of the Etoile 2000 short adventure. He’s now living in Finland (like Rhane Diallo?). I think, Super Etoile II de Dakar was something like a Super Etoile side project, with a different line up. Thanks again for these gems. Thank you so much for enlightening us on this, one can’t seem to find out enough. Merci beaucoup ! I’m not 100% sure & may be Lamtoro is right. After a quick internet research, things are not clear. Is someone could enlighten us? One thing is sure, Yamar played with the excellent Canari de Kaolack. Friends, if you want to know Yamar Thiam, you have him here here.